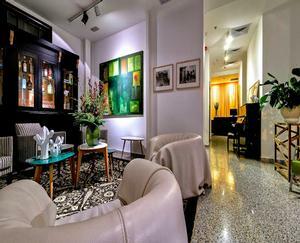 Welcome to the Townhouse Tel Aviv Hotel in the heart of colorful Tel Aviv, wonderfully located on the corner of Tel Aviv's' trendy and fashionable Rothschild Boulevard. The beautifully restored landmark building dates back from the 1930's, a discreet centrally located retreat for the traveler looking for something special, intimate, personal, unique with excellent service. Meticulously restored to its original splendour each of the 19 guestrooms have been individually and carefully conceived to reflect the charm and elegance of the restored building and the surrounding area. Enjoy the personal, sophisticated and chic boutique experience and enter a world that fuses stylish nostalgia with contemporary living. The Townhouse Tel Aviv truly is unique in an urban, timeless setting of elegance, warmth and honest charm. Be our guest and experience the expression of Tel Aviv living.